We went to Japan two and a half months ago, and I still haven’t gotten around to really blogging about the trip! Part of that is because I’ve been busy; most of that is because I’m not much of a travel blogger, I write about things I’ve been thinking about instead of places I’ve been to. But there is one place we went to on the trip that I wanted to blog about: the Ghibli Museum, specifically the museum’s Straw Hat Café. We saw a lot of wonderful buildings during the trip, but in its own way I think the cafe was the one that impressed me the most. So the cafe was something that they were thinking about, at least, and I already had reason to believe that the museum was unusually thoughtfully designed. When we got up to the eating area, though, I was a little nonplussed: there was a fairly standard looking food stand with some tents that didn’t excite me. But after looking around a bit more, I saw the cafe, and I was a little surprised that there didn’t seem to be a line. That was actually the first sign that the cafe was doing something unusual: observing it for a little while longer, there was a line, the line just didn’t look like the way I expected it to. There was a ring of seats near the entrance where people were waiting; one of the restaurant staff would emerge every few minutes, usher the next group in, and everybody would slide down a bit. People who were waiting were given menus to read, so they would be able to order quickly once they got inside; there were also a bunch of books lying around (mostly children’s books) for people to spend time with. So, basically, they transformed the probably inevitable wait time into a pleasant bit of relaxation; and from an organizational point of view, they used people’s time as efficiently as possible, and kept a steady trickle of people entering into the restaurant. High ceilings, quite a bit of space between tables (they would have room to pack in a lot more people if they chose), wonderful light from above and from the sides. But varied ceilings, too: in that picture you can see them sloping down towards a boundary area in front of the kitchen, and the colorful tilework above the arch to the kitchen. There’s a fair amount of variation in the main seating area, too: from that picture it might look like the table sizes are relatively uniform, but in fact there are a range of tables over on the right to comfortably seat a range of parties. And the attention to detail carried down to the dishes and tableware, too. The curry that I ordered was served on a plate with, if I’m remembering correctly, Totoros in a ring around the border counting off numbers. (Ah yes, it was the plate on the first and third pictures of this blog post.) But different orders had different plates; and everybody got a little flag in their meal with a Ghibli illustration on it. (They do Ghibli latte art, too.) More surprisingly to me, the different orders came with different specialized cutlery: it would have worked just as well if they’d set out a knife, fork, and spoon for everybody, but they instead took the occasion to signal to people that they’re paying attention to the specifics of your order. Good food, too: significantly better than standard museum fare, quite possible one of the two or three best museum meals I’ve ever eaten. (The quality of the food on this trip was very high indeed: I don’t know that there was any one meal that was stupendous, but several were quite good, and there was only one restaurant out of the two weeks that we were there that we regretted having gone into, which is amazing.) Yes, they’re in a museum, but they’re taking care with their food, they treat both the food and the clientele with respect. 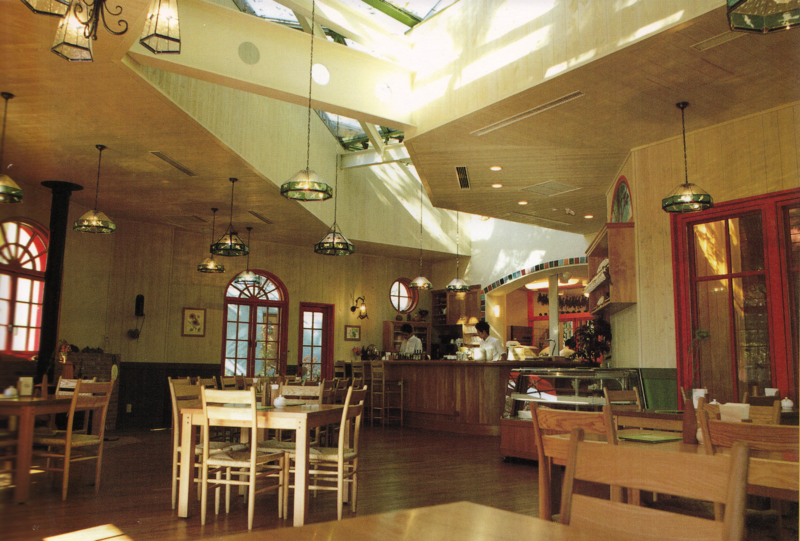 The very first goal that Miyazaki lists for the museum is that he wants “A museum that is interesting and which relaxes the soul”: based on the cafe, they absolutely succeeded in that. And the museum as a whole is wonderful: there are delightful architectural touches everywhere you turn. I would love to see how Christopher Alexander would analyze the cafe. Just thumbing through A Pattern Language , I see several patterns which seem relevant: Intimacy Gradient, Indoor Sunlight, The Flow through Rooms, Sequence of Sitting Spaces, Light on Two Sides of Every Room, Eating Atmosphere (in spirit, I think, though details are different for restaurant eating), Ceiling Height Variety, The Shape of Indoor Space, Windows Overlooking Life, Half-Open Wall, Interior Windows, Open Shelves, Structure Follows Social Spaces. (And that’s just for the cafe; I can’t recall another public place I’ve been to that did so well with Secret Place or Child Caves.) But it’s not just the patterns: it’s this feeling of attention to detail, of how the elements of the space work together to harmonize with each other and to harmonize with the people and activities that give those elements reason to be. The last book that I read on the trip was Alexander’s latest, The Battle for the Life and Beauty of the Earth: A Struggle Between Two World-Systems . If I’d read it at the start instead of the end, I would have been tempted to go visit the Eishin Campus; that would have taken a fair amount of time, though, so maybe the way things turned out is just as well. That latter book turns out to be really more about social organization than architecture, anyways: I will be thinking about it for a long time, I suspect, but I’m not at all ready to write about it here yet, I think I need a few more years of observation informed by that book first. The museum is great! Make sure you get tickets before you leave your home country, there’s only a limited allocation and they apparently sell out long before the date in Japan.